A fascinating woodland fern from Japan, Korea and nearby areas, Arachniodes standishii is commonly called ‘The Upside Down Fern’. The upper surface of the foliage has a raised structure that resembles that of the underside of many other ferns, hence the common name. 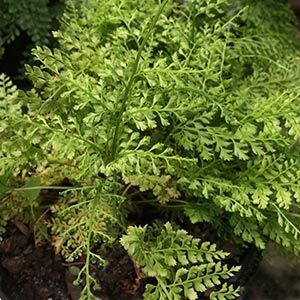 The fronds have a delicate lacy appearance, deeply cut and with prominent veins appearing on the upper surface. They are also very glossy, giving it a real sheen and adding to the overall impact. These veins along with a ruffled pinnae are what gives it the name ‘upside down fern’ these characteristics are usually on the underside. It is the good mid tonight green of the foliage along with the unique structure of the fronds that make this such an appealing fern. This is fern that naturally grows as an understory plant in forested area. Humus rich soil, filtered light and moisture are the main requirements. The main problems with growing this fern is overwatering, like most plants waterlogged soils and soggy potting mix are not suitable. Fertilise with a liquid seaweed fertiliser in spring and every two weeks until late summer. Hold back on water during winter. If growing indoors, keep Arachniodes standishii in a position away from heating ducts.